Ok, next one: a water tap. It's the one which you may already have recognized on the pictures I've posted before. It measures about 14x14x5cm and is modeled after the "HANSAFORM" by HANSA (even though not 100% accurate). To model this one in FreeCad, I started with a design drawing, which I found on the internet. I found out, that for such fixtures, it's worth doing a google image search. It's likely that you'll find a dimensioned drawing which is perfect to use as a template. It might be worth giving it a try to use such a drawing, vectorize it using e.g. InkScape (a free vector graphics program, I'd recommend) and then import it to FreeCad to work with that. FreeCad's "Import"-feature offers to import "SVG as geometry". I'll probably try this some time. 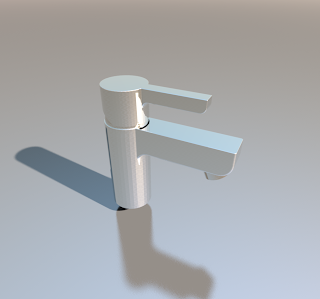 In case of this water tap, there are even DXF files available for download from the HANSA online product catalog, which - of course - could also be used for 3D-modeling. Anyway, I chose a different approach. Luckily, my girlfriend and I share a taste for simple design, so we chose a tap which's design is a combination of basic geometries: squares and circles. For the 3D-model, this means that it could easily be constructed by combining cylinders and boxes. I took the sizes and positions for these from the drawing and quickly had the basic design. One detail which is hard to see on the picture above is, that the lever rests on a sphere, so that it can be tilted and turned on the base part. This means, the model can be seen as two parts: the base, consisting of two cylinders, a box and a sphere and the lever, which is one cylinder and a box. In order to allow tilt, the back end of the lever is beveled, which I modeled by cutting a box (placed with an angle) off the lever. The final work was to use FreeCad's fillet feature for the edges with different radiuses for soft and sharp edges. For use in SweetHome3D, I did the same as with the towel rail. First, I exported from FreeCad to .obj, then imported to SweetHome3D and exported again. After that, I modified the material file to use the mirror material for a chrome look and finally again did an import and export via SweetHome3D to get a clean .obj and .mtl. I spent some time to get the picture on top of this post, because, when I tried to simply put the tap into a new SweetHome3D project and then make a photo, that didn't look good because it was to "flat" and boring. Also, the contrast between the tap and the background of the scene was poor, because the tap is a mirror but there is nothing which could reflect on it. The trick I ended up with, was to put the tap onto a glass plate, which causes some reflection that helps making the scene a bit more interesting. I you need a simple glass cube, which you can scale as you like, you can download it here. The tap can be downloaded here.